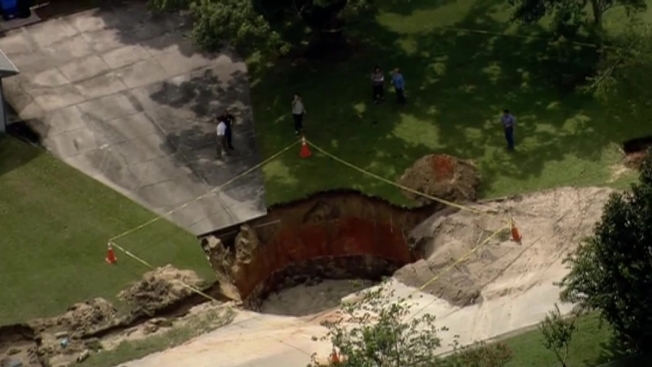 A massive 65-foot sinkhole opened up in a Central Florida neighborhood on Sunday. According to a report from NBC affiliate WESH, the hole opened up around 1 p.m. in a neighborhood in Groveland, police said. One resident had to be evacuated from the area. Nearby residents, including some local schools, were under a boil water alert. Groveland Police told residents that the boil water alert would remain in effect until the sinkhole could be filled. Geologists said that the onslaught of rain that has drenched part of Florida over the past month could potentially lead to more sinkholes. Heavy rains weigh down soil and sand, increasing the likelihood that it will collapse into holes in the bedrock below and form depressions or sinkholes. Experts warn property owners to pay extra attention to warning signs such as dips in the yard or new structure cracks in buildings and sidewalks.